Egypt built a new cathedral in Cairo, but quietly shuts Coptic churches in villages all over the country. Ashraf Ramelah, founder and president of Voice of the Copts, has recently given testimony to the Canadian Parliament on the revolution taking place in Egypt. Please visit www.voiceofthecopts.org to read more. On January 6, Coptic Christians celebrated mass during the grand opening of the brand-new state-built Nativity of Christ Coptic Orthodox Cathedral in the state’s new administration district of Cairo. Those in attendance rejoiced at the occasion but many rural villagers had no local church to attend. Cairo now has another (a third) cathedral, thanks to President Al-Sisi who is also responsible for the rise in church closings in 2017. This brings the total number of shut-downs for Christians to twenty-seven hundred. Roughly half of all Orthodox churches in the country are nonoperational. This did not happen overnight. It was a gradual process beginning with the Nasser regime that continued through the subsequent Islamization of Egypt. In 2017, Law 80-2016 was enforced by the Al-Sisi regime so that all premises used for worship by Christians, yet still without permits, would be grandfathered in and issued one. When all clergy around the country responded to the state’s request for comprehensive lists of churches for this purpose, local police instead used the master list to legally close them down. The Al-Sisi government never responded. Last year, Copts experienced an increase in violence. A common thread in most cases was that police, if at all present, stood down or were nowhere to be found in crucial moments. This fact reflects poorly on Al-Sisi who has vowed to protect Christians. The final two weeks of December alone demonstrate their vulnerability after four years with a president who claims favor with the Copts. Approximately two thousand worshipers leaving a mosque ambushed a village church in the Giza governorate, north of Cairo, in order to stop the erection of a church bell (disallowed by law). It turned out to be a false accusation. Injuries to seven parishioners and damage to sacred property was a result of the weaponized use of wooden clubs, heavy rocks and steel bars. Satisfied, the attackers dispersed. Police patrols stood down and watched, then stepped in to board up the church. Seven days later two men with bombs strapped to their bodies fired rounds from machine-guns and killed a church guard (uniformed police officer) during a church service south of Cairo in Helwan. Parishioners heard the rapid fire from inside the church and ran to lock the doors while the gunmen proceeded to kill ten Christians on the church grounds. One perpetrator was shot and killed by the church guard before the guard was in turn killed. The other spent ten minutes more at-large while police patrolled the perimeters and surrounding streets doing nothing to step in. Finally, a pedestrian snatched up the gun of the dead guard and shot the second perpetrator, injuring him. He was captured by civilians and handed over to police who suddenly appeared. On New Year’s Eve two Coptic Christian men with their children stopped to visit a store owner and friend in Omranya, the suburban town of Cairo, on their way back home from a church service. Two masked gunmen who yelled slurs and curses at Christians opened fire and killed the two brothers. Traumatized, the children survived the bloody scene begging for their fathers. After a terrible year of violence and church closings, Copts who attended the Cairo cathedral’s Christmas Eve service paid homage to Egypt’s head-of-state. On what is normally a solemn religious occasion, congregants waved Egyptian flags and leapt over pews -- yelling praise at the president upon the dais. The strictly conservative clergy allowed this commotion, making an exception in order for parishioners to celebrate the visiting president. 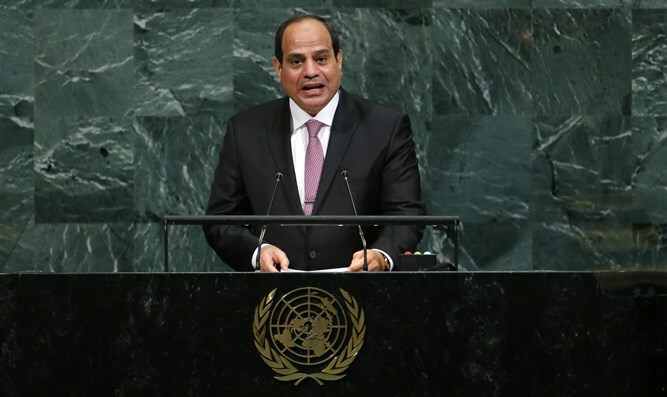 Coptic support for Al-Sisi is at an all-time high as he approaches his re-election campaign in March. Orthodox clergy including the pope overwhelmingly support the president. Symbolically, two gold framed poster-sized portraits of the pope and the president hung prominently side-by-side on the interior side wall of Nativity Cathedral. This is completely out of character for the church as the sanctuary only ever carries pictures of saints and never insinuates politics. This violation of centuries-old Orthodox tradition represents the strong influence of the Islamic state and President Al-Sisi over the church and Pope Tawadros II. By all appearance, the pope is submitted to Islam and with him is the Orthodox body. He recently met with the Grand Imam and declared that while God protects Christians from heaven, “Muslims protect us in the earth.” His diplomacy apparently included the removal of his ever-present cross worn upon his chest so as not to offend Islam’s religious head. Is this the pope’s strategy to bring safety and peace to the Copts? If so, it’s not working. The US Congress is aware of the bloodshed and so recently presented a bill to deal with the discrimination and oppression of the Egyptian Coptic minority. However, Pope Tawadros II condemned the American attempt to alleviate persecution of Christians by deeming it “interference” and not welcome. He is not the first pope to show his loyalty to the Islamic state and the regime, forsaking his people by appeasing their oppressors. More and more Copts are beginning to openly criticize clergy statements and actions. In their observations and discussions of the pope resides a daring never before seen. Strong opposition and questioning can be heard within blogging circles. Although the discontented have both voice and sound reason, it is unlikely any sort of unified political voice will emerge in the near future for the Coptic community as long as the clergy fills this role.